This is true one page checkout for VirtueMart. 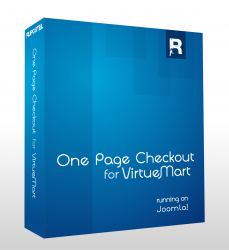 This is a MUST HAVE for VirtueMart and makes checkout process much more comfortable and provides many features which are missing in basic VirtueMart configuration. As far as our customers say, it really raises your sales. Our company specializes on VirtueMart and Joomla modifications which make user experience better such as speed optimalization, checkout process and SEO. Our business model is based on providing complete ecommerce solutions based on VirtueMart and Joomla which we support by various marketing activities and we take provisions of sales of our hosting customers. This was the number one reason to create this component - to raise sales of our hosting customers and it was sucessfully done. We develop this component since 2008 and we provide continuous support for it every day.